First things first. Bulletproof Coffee. You know what it is, right? What?! You don’t?! Well then you better get your head out of your…Starbucks and read more internet blogs and follow more crossfitters on Instagram. Lol. Because this sensation isn’t even ‘sweeping’ the internet right now. It has swept the internet, and really society as a whole. Bulletproof coffee is, originally, the practice of mixing butter and coconut oil into your morning coffee. And viola! You become instantly super fit and toned. Or jacked if you’re a dude. And your beard would grow into a big beautiful mountain-man beard. But no really, you’re supposed to follow a crazy eating/fasting protocol. I think the original way was you aren’t supposed to eat for like 18 hours except for drinking this coffee. But that doesn’t happen. Folks drink their bulletproof coffee and then eat breakfast an hour later. Or worse yet, just drink bulletproof coffee right alongside their meal. Not a great way to get that dream body. But I ramble. All you need to know really is that there is a company built around the original premise. They sell, you guessed it, coffee, and oil to put in it. I don’t think they sell the butter. But anyways. It’s a trendy health brand that I’ve never reviewed yet. So when I saw their protein bars at Whole Foods, I snatched one up immediately. Well. Two. They have chocolate and vanilla. So first off why don’t we talk about what the best flavor of Bulletproof protein bars are. The better flavor of the two Bulletproof bars is the vanillamax. I can still taste it’s sweat, saltiness in the back of my mouth. It was far superior to the chocolate, but the chocolate was still good. I think the vanilla had a more pronounced ‘vanilla’ flavor, and was supplemented by a saltier taste in the mouth. I am a big fan of the Vanillamax flavor. I could eat them all day long. The chocolate, or ‘Upgraded Chocolate’ as they call it, was also tasty, but wasn’t quite as good. They weren’t as salty, they weren’t quite as sweet, and they just weren’t the sort of chocolate flavor that I like most, which is a big, bold, dark chocolate flavor. This one was just sort of mild and simple. While the flavors of Bulletproof Bars are quite tasty, the texture of Bulletproof bars is not very good at all. Firs of all, they don’t fill out their package very well at all. They are about half as long, which makes it a little disappointing once you get it open. The second thing is just how greasy they are. That’s right, greasy. You open a package of Bulletproof bars, and al of a sudden you have a layer of oily grease on your hands. It’s like maple syrup. No matter what you do, it’s GOING to get on your hands. So that’s kind of annoying. Mind also seemed sort of melted for some reason, even though I had literally just bought them out of Whole Foods. The last thing is that actual mouth texture. They sort of crumble apart in chunks, and then when you bit into them, they sort of collapse between your molars in a sandy way. It’s not very rewarding, and there is very little chewing as the bar disintegrates in your saliva. The flavor is terrific, but the texture leaves something to be desired. So that’s the taste. How about the ingredients themselves? Are Bulletproof Bars healthy? It’s just like the Bulletproof coffee. If you drink it and don’t eat for like 8 hours, then sure you’re going to throw your body into a state of ketosis and then lose fat and think more clearly and blah blah BLAH blah blah. And grow a bear and do crossfit. Boy do I hope a Bulletproof exec reads this and thinks ‘This little B-I-T-C-H doesn’t know what she’s talking about…’ Ah the freedom of speech. But anyways. I doubt he’d get too upset- I think Bulletproof as a company is KILLING it. And I’m actually quite fond of their brand, I just have my skepticism that people have the dedication and self-control to use their products in a way that they are actually improving their health from it. Can you see what I’m saying now? As with the coffee, this is very fatty food product. An entire THIRD of the bar is fat, including SEVEN grams of saturated fat. Like I said. You don’t need this bar if you’re well fed. You don’t need this bar unless you’re starving or in the midst of an 18 hour fast or a 13 hour hike or a marathon or something. I suppose yes you could use it as a meal replacement or something, but for most folks who don’t follow a ketogenic diet, the fat content in these bars sort of polarize it and make it mostly incompatible for most folks who follow a traditional high protein, low-fat American diet. Organic cashew butter, Bulletproof® Upgraded Collagen Protein, chicory root fiber, Bulletproof® XCT™ Oil Powder, (Caprylic and Capric Acid Triglycerides sourced from coconut and/or palm kernel oil) organic cashews, organic Bulletproof® Upgraded Chocolate Powder (raw cacao powder), Bulletproof® Brain Octane (Caprylic Acid Triglycerides sourced from coconut and/or palm kernel oil), organic coconut oil, sea salt, stevia. So yeah. You’re basically eating a big slab of cashew butter with added fat oil in it, and then some flavoring ingredients and salt. I think that explains the mostly bad texture and oily-ness. I wish they actually contained it within an outer coating to make it more dynamic in texture and also less of a mess to eat. Overall it IS healthy, but as with nut butters, they can become very unhealthy in most situations- meaning more often than not you just mindlessly eat them when you don’t need more calories. And these calories stack up in a HURRY. If their was ever a company and a product that could and should make something that just looks SICK, it is Bulletproof and Bulletproof Bars. But they’ve really dropped the ball here. These bars come in a very generic, washed-out, overall very weak and lacking character, label. 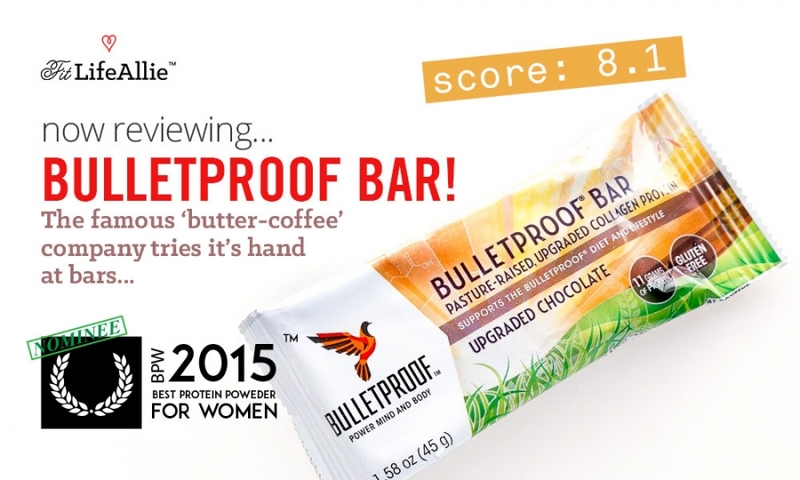 Which is a shame because Bulletproof has a fantastic name and logo, but for whatever reason they chose this super boring white them, with Nature Valley/stock photo background graphics, and very weak copy-writing. Nobody even knows what collagen protein is, and by looking at the label, you still have no idea WHY you should buy this bar. It’s just horrid packaging. They don’t sell you on it in any way. I wouldn’t be surprised if they are really struggling to move these off shelves because of the miserable packaging. Like. It’s literally the same graphics package as Nature Valley granola bars, and Hidden Valley Ranch salad dressing come to think of it. Really bad. Ok. Let’s get this Bulletproof review wrapped up.